Porsche has made a successful start into the second half of the season in the Sports Car World Endurance Championship WEC: At the six-hour race in Mexico City on Sunday, the Porsche GT Team scored its fourth podium result this season with the new 510 hp 911 RSR, when Richard Lietz (Austria) and Frédéric Makowiecki (France) crossed the finish line as third in the GTE-Pro class after 208 laps on the Autódromo Hermanos Rodríguez. Thanks to this result, they advanced to second place in the drivers’ world championship standings. In the GTE-Am class, in which Porsche’s customer squads field the 2015-spec 911 RSR, Dempsey Proton Racing with the Porsche Young Professional Matteo Cairoli (Italy) clinched its second win of the season. As a dark cloudbank moved over the Autódromo Hermanos Rodríguez and a few drops of rain began to fall, the race seemed to be at a tipping point. With just 40 minutes left to the flag on the tradition-steeped 4.304-kilometer racetrack in Mexico City, a rain shower so close to the finish would have opened the door wide to chance. Luckily, the track remained mostly dry in the final laps of yet another entertaining and gripping race, particularly in the GTE classes. For the third time this season, Richard Lietz and Frédéric Makowiecki climbed the podium. Third place at the season-opener in Silverstone, second at the home race on the Nürburgring and now third again – the drivers of the #91 car are well placed to tackle the second half of the season, which continues in a fortnight in Austin, Texas. With this success, they have moved up the points table to now rank second in the GT Drivers’ World Championship and are once again within striking distance of the title. The Porsche GT Team has also moved into second place in the team classification. For their teammates Michael Christensen (Denmark) and Kévin Estre (France), things didn’t work out quite as well in Mexico. In the second 911 RSR (#92) fielded by the Porsche GT Team, the pair ended up on fifth place after a far from ideal race. When Michael Christensen tried to overtake an amateur-class Ferrari in the first hour of racing, the Ferrari shunted the #92 car from the side. This incident was one of several for the third-place getter from the Nürburgring. When a caution phase towards the end of the race thwarted their strategic plans, all hopes of catching up were dashed. 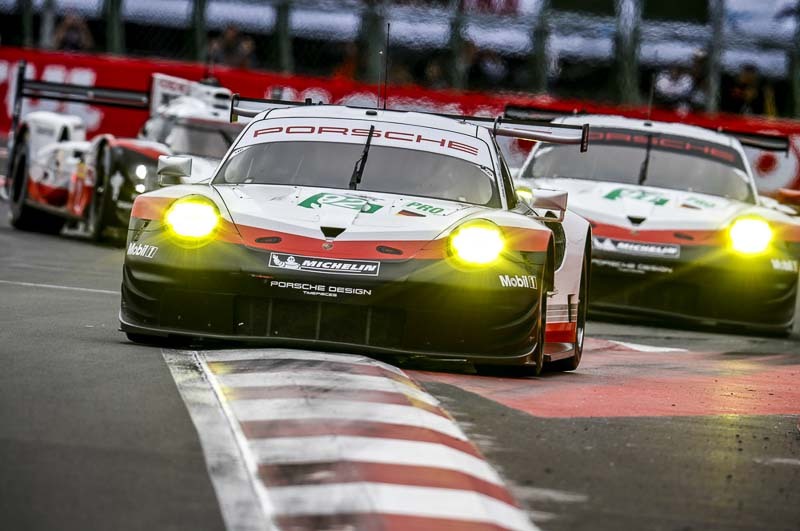 The strong Porsche showing in Mexico, where the WEC raced only for the second time, was made perfect by the customer teams in the GTE-Am class. Dempsey Proton Racing with the Porsche Young Professional Matteo Cairoli and his German teammates Christian Ried and Marvin Dienst, celebrated their second win of the season after the Nürburgring victory in the 911 RSR. The joint partner Patrick Dempsey congratulated the team via Twitter immediately after they crossed the finish line. The British drivers Ben Barker and Michael Wainwright as well as Australia’s Nick Foster climbed the podium for the first time after securing their best result of the season for Gulf Racing with third place. Round six of the Sports Car World Endurance Championship WEC will be contested in Austin/USA on 16 September.